Back this week with an adorable image from Whipper Snapper for this card as inspiration for the Crafty Catz challenge blog. I LOVE WHIPPER SNAPPER - they couldn't be any cuter. When this challenge suggested I could use any image of my choice, they were my go-to stamps. 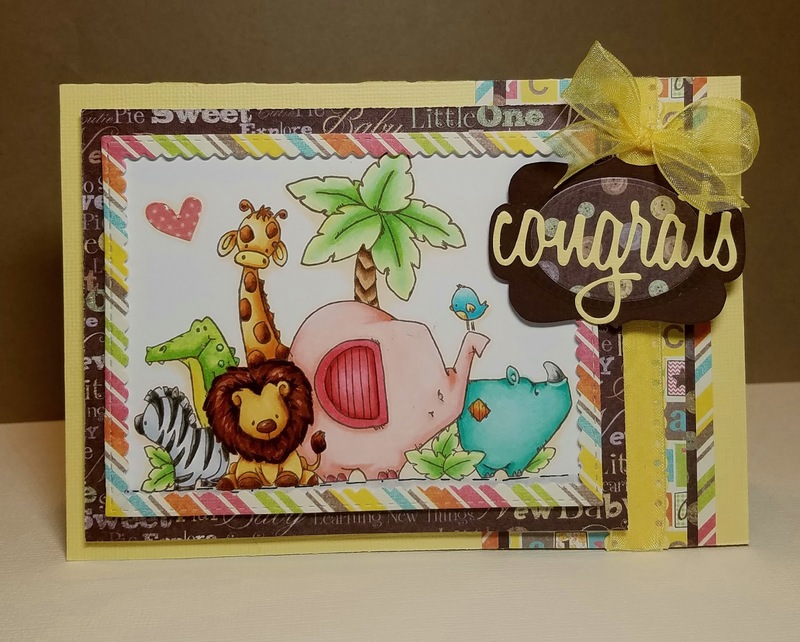 My niece is having a baby shower this weekend - so what better chance to use this adorable image Sweet Safari. I colored it up with my Copics and found some design papers in my scraps - I think they are from Die Cuts With A View and matched perfectly. The challenge is to add a touch of pretty ribbon, so the yellow ribbon above the die cut sentiment is a finishing touch to complete the card. There are some great chances to win prizes from Crafty Ribbons and participate as a guest designer over at Crafty Catz this week... head on over and play along with us. I would love to see what you are creating! Happy Friday - have a great weekend! This is so sweet and so, so adorable!!! Such fun colors and papers, and great coloring of that image! Loving all of those layers, thanks for playing along with 4 Crafty Chicks, hope to see you again! Great paper and the image is perfectly sweet, thanks for sharing with us at 4 Crafty Chicks. Awesome layers. OH MY.......what a beautiful card! I LOVE your coloring!! Fabulous image, it makes a stunning card.